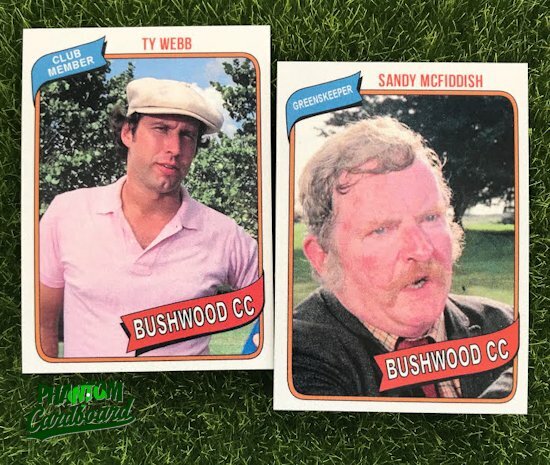 Caddyshack would fall under the ‘it’s about time’ heading when it comes to new additions to PCb custom trading cards. 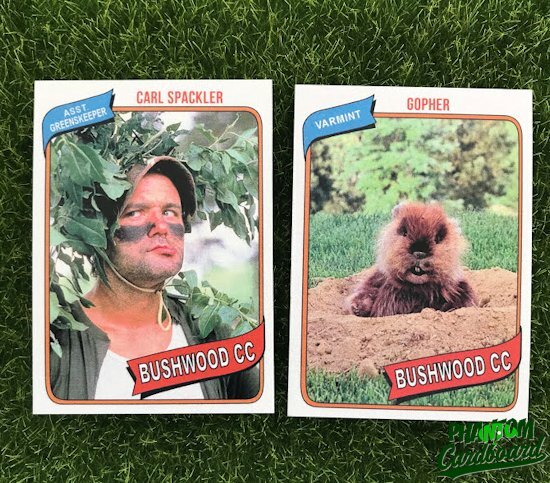 Gotta have Caddyshack, right? This mini-set was a lot of fun to make. 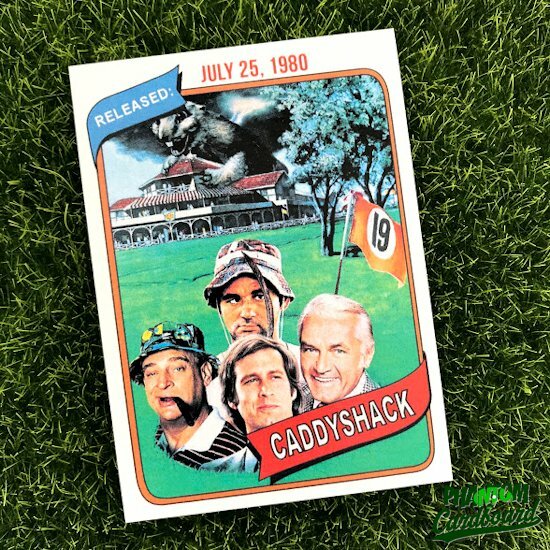 I have to believe Caddyshack is on most comedy fans shortlist and the #1 best golf comedy -- that or Happy Gilmore, depending on the age of who you ask. 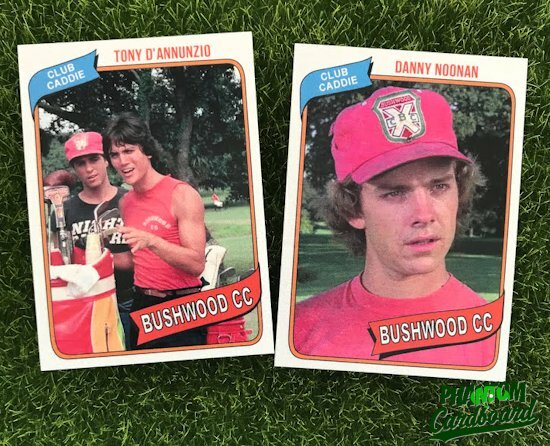 I finally got to again use the 1980 Topps baseball inspired design I created for my "Bubba Newman" card. The 1980 design is super nostalgic looking to me. I throw the word ‘nostalgic’ around a bunch. You can find ‘nostalgia’ defined as: a wistful or excessively sentimental yearning for return to or of some past period or irrecoverable condition. That’s what this design is to me. My cards in general are made to evoke nostalgia, mashing two things from my own past that I look back on fondly; ‘80s (mostly) pop culture and trading cards. 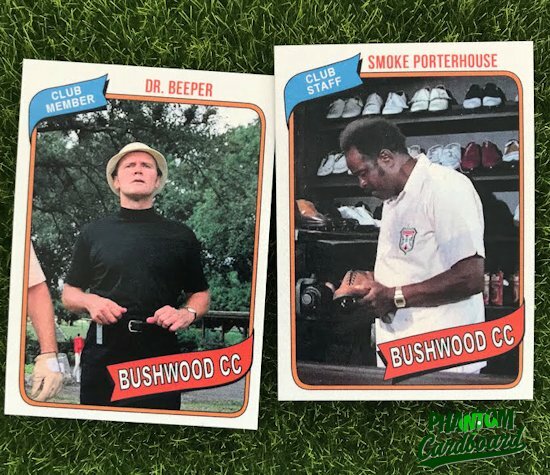 You could give me any year in the ‘80s and I immediately identify it with what cards from Topps (and to a lesser extent the other brands) looked like that particular year. When I would part the two folds of a wax pack what was inside was very similar to the cards I make today. They didn’t have any gold foil stamping. There was no high gloss UV coating. There wasn’t 25 different releases to choose from at upwards of hundreds of dollars per pack that are secured in a metal briefcases. No cut up pieces of jerseys or manufacturer certified autographed cards. The cards were on a, for lack of more flattering descriptors, rough and almost cheap feeling cardboard stock. The graphics weren’t crisp with computer generated precision, but that was part of the charm. That’s not to say they weren’t cool looking. They were, and could keep the eye busy. This was before the picture quality dominated the card to the point where it looked like you were holding a photograph taken from courtside seats. That’s cool and all but give me the halftone dots any day of the week and I’ll be happy. In a nutshell Phantom Cardboard trading cards are a tangible yearning for a simpler time. Stepping down from my soapbox now, I love how these came out. That’s probably another statement I overuse on this blog, but I would think if I didn’t like a card set I made I wouldn’t show it off. 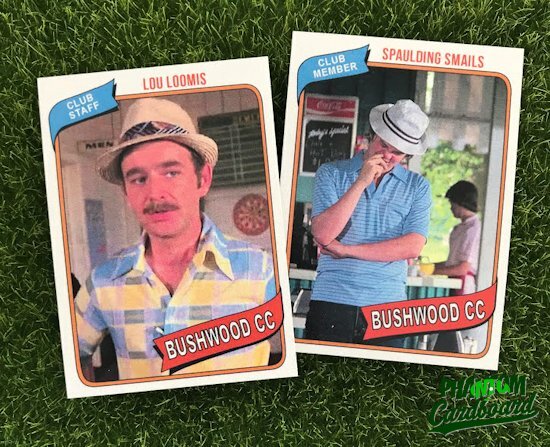 I swapped the player position text for the character’s role at the "Bushwood Country Club". The card’s color scheme is from the 1980 Topps St. Louis Cardinals colors. 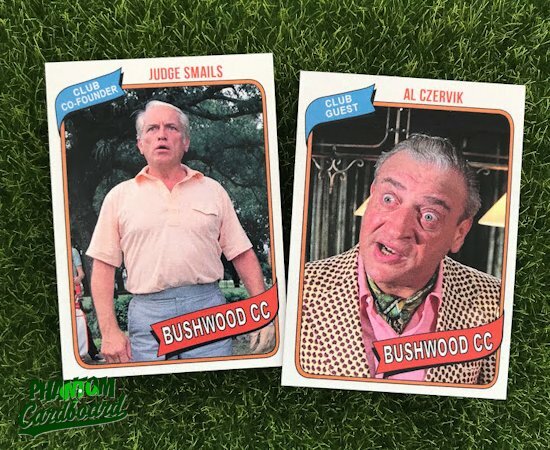 "Bushwood" is supposed to be located in Nebraska. Had it been set in a state that had a Major League team I would have chosen that team’s colors. I went with the Cardinals schemes because the Caddie’s shirts were somewhat of a red color. I recently read that both Chevy Chase and Bill Murray (John Travolta as well) turned down the role of Forrest Gump.